User interface: this includes the address bar, the back and forward buttons, bookmarking menu, etc. In essence, this is every part of the browser display except for the window where you see the web page itself. 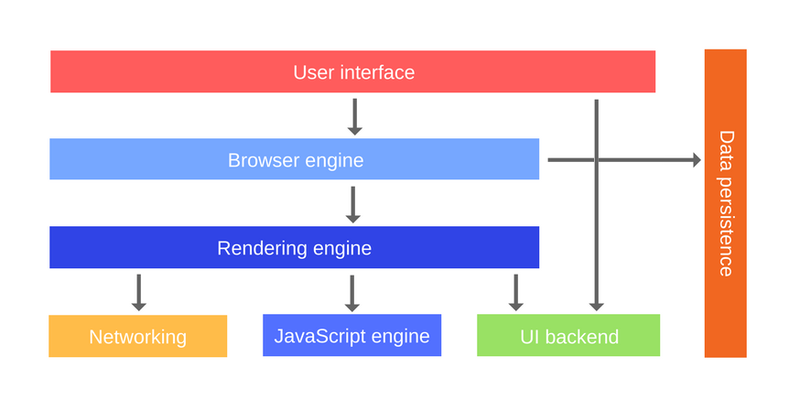 Rendering engine: it’s responsible for displaying the web page. The rendering engine parses the HTML and the CSS and displays the parsed content on the screen. Networking: these are network calls such as XHR requests, made by using different implementations for the different platforms, which are behind a platform-independent interface. We talked about the networking layer in more detail in a previous post of this series. UI backend: it’s used for drawing the core widgets such as checkboxes and windows. This backend exposes a generic interface that is not platform-specific. It uses operating system UI methods underneath. Data persistence: your app might need to store all data locally. The supported types of storage mechanisms include localStorage, indexDB, WebSQL and FileSystem. The main responsibility of the rendering engine is to display the requested page on the browser screen. Rendering engines can display HTML and XML documents and images. If you’re using additional plugins, the engines can also display different types of documents such as PDF. The rendering engine receives the contents of the requested document from the networking layer. The first step of the rendering engine is parsing the HTML document and converting the parsed elements to actual DOM nodes in a DOM tree. Basically, each element is represented as the parent node to all of the elements, which are directly contained inside of it. And this is applied recursively. Do you wonder why does the CSSOM have a tree structure? When computing the final set of styles for any object on the page, the browser starts with the most general rule applicable to that node (for example, if it is a child of a body element, then all body styles apply) and then recursively refines the computed styles by applying more specific rules. Let’s work with the specific example that we gave. Any text contained within a span tag that is placed within the body element, has a font size of 16 pixels and has a red color. Those styles are inherited from the body element. If a span element is a child of a p element, then its contents are not displayed due to the more specific styles that are being applied to it. Also, note that the above tree is not the complete CSSOM tree and only shows the styles we decided to override in our style sheet. Every browser provides a default set of styles also known as “user agent styles” — that’s what we see when we don’t explicitly provide any. Our styles simply override these defaults. 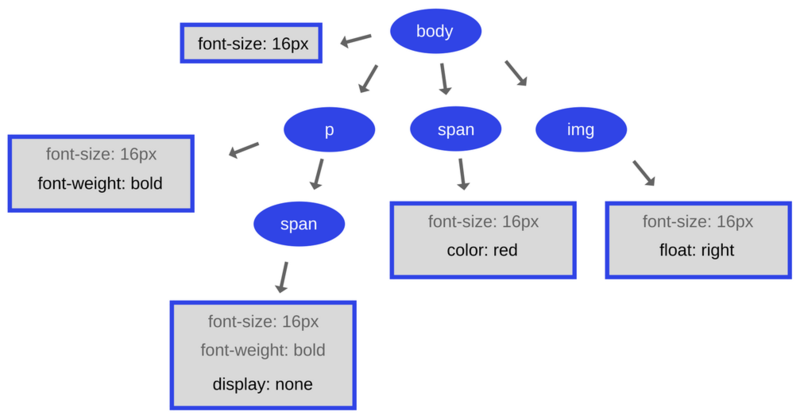 The visual instructions in the HTML, combined with the styling data from the CSSOM tree, are being used to create a render tree. What is a render tree you may ask? This is a tree of the visual elements constructed in the order in which they will be displayed on the screen. It is the visual representation of the HTML along with the corresponding CSS. The purpose of this tree is to enable painting the contents in their correct order. Each node in the render tree is known as a renderer or a render object in Webkit. Starting at the root of the DOM tree, it traverses each visible node. Some nodes are not visible (for example, script tags, meta tags, and so on), and are omitted since they are not reflected in the rendered output. Some nodes are hidden via CSS and are also omitted from the render tree. For example, the span node — in the example above it’s not present in the render tree because we have an explicit rule that sets the display: none property on it. For each visible node, the browser finds the appropriate matching CSSOM rules and applies them. Each renderer represents a rectangular area usually corresponding to a node’s CSS box. It includes geometric info such as width, height, and position. When the renderer is created and added to the tree, it does not have a position and size. Calculating these values is called layout. 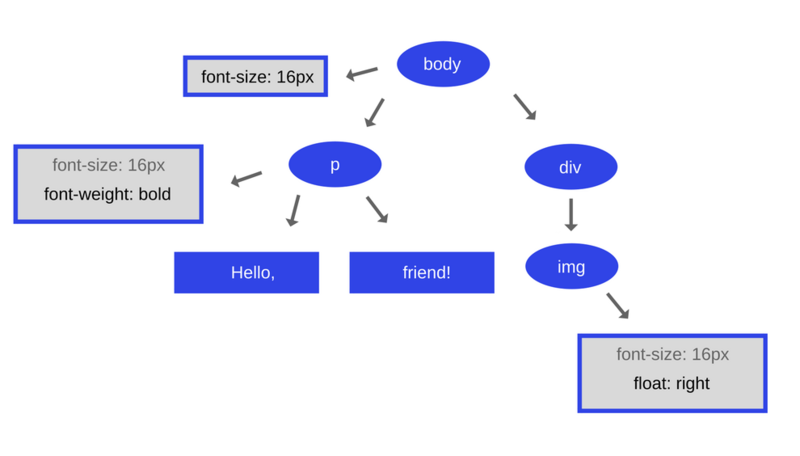 HTML uses a flow-based layout model, meaning that most of the time it can compute the geometry in a single pass. The coordinate system is relative to the root renderer. Top and left coordinates are used. Layout is a recursive process — it begins at the root renderer, which corresponds to the <html> element of the HTML document. Layout continues recursively through a part or the entire renderer hierarchy, computing geometric info for each renderer that requires it. The position of the root renderer is 0,0 and its dimensions have the size of the visible part of the browser window (a.k.a. the viewport). Starting the layout process means giving each node the exact coordinates where it should appear on the screen. In this stage, the renderer tree is traversed and the renderer’s paint() method is called to display the content on the screen. Global — the entire tree gets repainted. Incremental — only some of the renderers change in a way that does not affect the entire tree. The renderer invalidates its rectangle on the screen. This causes the OS to see it as a region that needs repainting and to generate a paint event. The OS does it in a smart way by merging several regions into one. In general, it’s important to understand that painting is a gradual process. For better UX, the rendering engine will try to display the contents on the screen as soon as possible. It will not wait until all the HTML is parsed to start building and laying out the render tree. Parts of the content will be parsed and displayed, while the process continues with the rest of the content items that keep coming from the network. Scripts are parsed and executed immediately when the parser reaches a <script> tag. The parsing of the document halts until the script has been executed. This means that the process is synchronous. If the script is external then it first has to be fetched from the network (also synchronously). All the parsing stops until the fetch completes. HTML5 adds an option to mark the script as asynchronous so that it gets parsed and executed by a different thread. Style calculations — this is the process of determining which CSS rule applies to which element based on matching selectors. Once the rules are defined, they are applied and the final styles for each element are calculated. Layout — once the browser knows which rules apply to an element, it can begin to calculate how much space the latter takes up and where it is located on the browser screen. 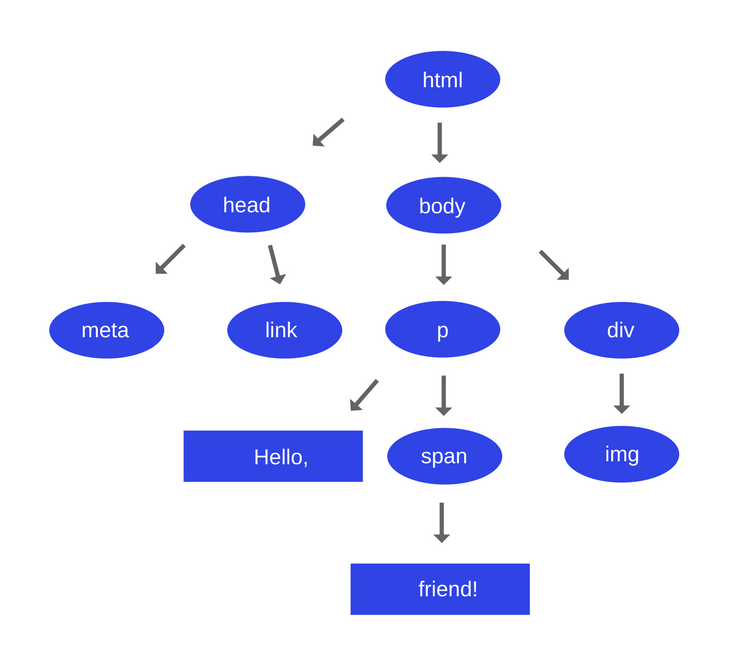 The web’s layout model defines that one element can affect others. For example, the width of the <body> can affect the width of its children and so on. This all means that the layout process is computationally intensive. The drawing is done in multiple layers. Paint — this is where the actual pixels are being filled. The process includes drawing out text, colors, images, borders, shadows, etc. — every visual part of each element. Compositing — since the page parts were drawn into potentially multiple layers they need to be drawn onto the screen in the correct order so that the page renders properly. This is very important, especially for overlapping elements. Avoid setTimeout or setInterval for visual updates. These will invoke the callback at some point in the frame, possible right at the end. What we want to do is trigger the visual change right at the start of the frame not to miss it. Use micro-tasks to introduce DOM changes over several frames. This is in case the tasks need access to the DOM, which is not accessible by Web Workers. This basically means that you’d break up a big task into smaller ones and run them inside requestAnimationFrame , setTimeout, setInterval depending on the nature of the task. Modifying the DOM through adding and removing elements, changing attributes, etc. will make the browser recalculate element styles and, in many cases, the layout of the entire page or at least parts of it. Reduce the complexity of your selectors. Selector complexity can take more than 50% of the time needed to calculate the styles for an element, compared to the rest of the work which is constructing the style itself. Reduce the number of elements on which style calculation must happen. In essence, make style changes to a few elements directly rather than invalidating the page as a whole. Reduce the number of layouts whenever possible. When you change styles the browser checks to see if any of the changes require the layout to be re-calculated. Changes to properties such as width, height, left, top, and in general, properties related to geometry, require layout. So, avoid changing them as much as possible. Use flexbox over older layout models whenever possible. It works faster and can create a huge performance advantage for your app. Changing any property other than transforms or opacity triggers a paint. Use it sparingly. If you trigger a layout, you will also trigger a paint, since changing the geometry results in a visual change of the element. Rendering is a vital aspect of how SessionStack functions. 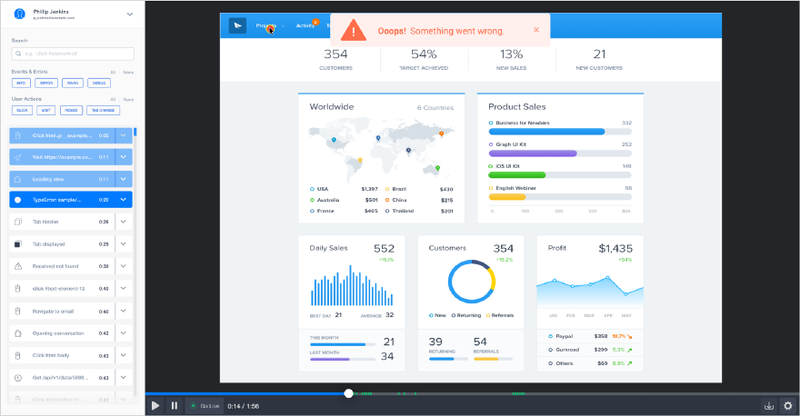 SessionStack has to recreate as a video everything that happened to your users at the time they experienced an issue while browsing your web app. To do this, SessionStack leverages only the data that was collected by our library: user events, DOM changes, network requests, exceptions, debug messages, etc. Our player is highly optimized to properly render and make use of all the collected data in order to offer a pixel-perfect simulation of your users’ browser and everything that happened in it, both visually and technically. There is a free plan if you’d like to give SessionStack a try.